People are still marveling at the scenic ice caves in northern China. Recently pictures have emerged of these ice caves where the ice is said to be over three million years old. The caves are located near Ningwu County of Xinzhou City at the north end of the Shanxi Province. The caverns are spectacular and contain icicles of tremendous size and the cavern stays cold all year long. It’s said that even outside the caves the breeze is cool. There are ice caves like these in several parts of the world. They afford a brilliant look into the past and archaeologists and other scientists who study the ages find these caverns priceless. First of all they are often enormous and meander into different areas of the subterranean world. These caves can hold secrets that otherwise would never have been discovered. These ice caves can give us data on the age of plants, animals, and more. Scientists are super careful when they do investigate these caves because they could contaminate them with present day materials thus throwing off any analysis. These explorations have to be very carefully done which is why China takes great steps to make sure their ice caves stay as pristine as possible. 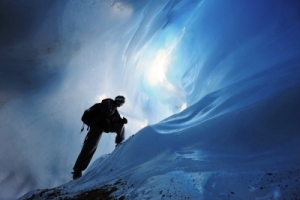 Ice caves in the United States are found in most areas even in the hot south. They too are cautiously taken care of. Some have tours like in upstate New York. Canada has ice caves and Mexico also. There’s no telling how many caverns there are with ice but the ones we know of often have been cited by earlier explorers and settlers. These folks would often chip ice from the caves during the hot months but that wasn’t a good idea. It may have done wlll fro ice cellars where people stored meats and other valuables. In the new technologies of today, the Chinese have the opportunity to use probes an take pictures and videos like never before. Their scientific exploration of these caves now allows for scientists to get a good idea of what life was like 3 million years ago. Are there any bugs or small creatures or spores trapped in the ice? What can we learn? Needless to say these ice cave explorations are going to give the Chinese and rest of the world a glimpse into the past and future. Posted by News on May 10 2012. Filed under Featured, New, Travel. You can follow any responses to this entry through the RSS 2.0. Both comments and pings are currently closed.